Last week, I decided to free up some space in my closet and gave some of my clothes that I no longer use to charity. But hey look what I found! It's my crocheted top. 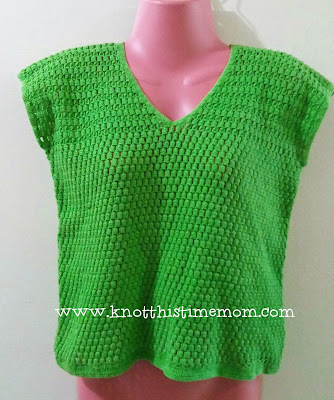 I made this top 20 years ago, my very first crocheted top project. Did this without a pattern. Back then, I only knew few of crochet techniques and terminologies, like dc, sc, hdc and chain. I never knew that the technique I used here was called 'cluster stictch'. I learned to crochet at the age of 8, by seeing my'nanay'(mom) making crocheted curtains from the threads that my father gathered from the sacks of Feeds (for pigs) from the piggery/farm where he used to work. But it was only basic stitches. When I had reached my Grade 5, the school thought us to crochet, again only basic stitches. ever crocheted top. But then it was also my last project at that time since I found the materials/threads to be expensive and I didn't have enough money to support this craft. Until I had my 5th child, I was browsing the internet in search for a headband to buy for her. I found a simple crocheted headband and thought that I could easily make one for her. And the rest is history... Now I'm hooked.